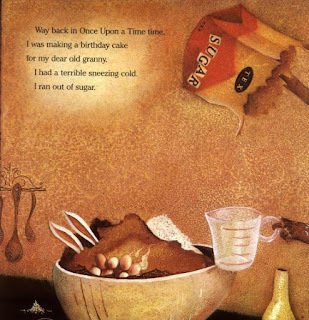 I don't know what it is about The Story of the Three Little Pigs, but for whatever reason, this fairy tale more than any other has been subject to retelling over and over again. We're never really satisfied with the story as it is in its original form, and so we go out of our ways to make it into something new every time. That's kind of weird, right? We don't do that as much with any other fairy tales I can think of. 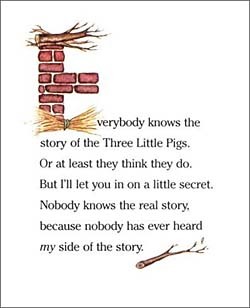 Sure there are revisionist versions of just about everything, but the main focus with The Three Little Pigs seems always to be in changing the actual meat of the story. The pigs aren't the good guys or the wolf is a pacifist or everyone is just being mean all around. 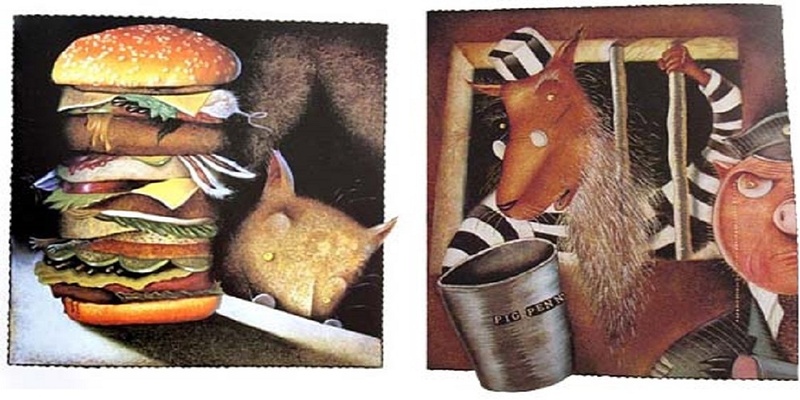 No other story in our language of fairy tales and fables gets messed with quite like The Three Little Pigs. And I'm not sure what that really says about us. On the one hand, it might say some really good things. The story is, after all, a pretty simple tale of how if you don't properly prepare for the future you're screwed - but somehow we've shifted it into being a view on the human condition, with each new version espousing a new idea of humanity and morality. Which is weird, right? That's weird. 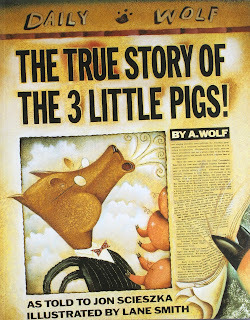 Obviously today I'm talking most about The True Story of the Three Little Pigs by Jon Scieszka and Lane Smith. 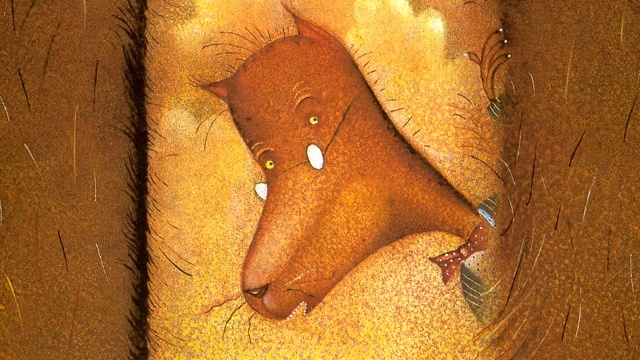 The story, which first came out in 1989 and became a pretty instant children's classic, is a retelling of the original story only from the wolf's point of view. It's not the nice sanitized version, either, where the pigs run away from their houses before the wolf can blow them down. This is a story where the wolf comes and does indeed blow the houses down and then eat the pigs - it's just that in this version we're led to question why the wolf did it. According to our hero, Alexander T. Wolf (or A. Wolf), the only reason he was out and about that day was to borrow a cup of sugar to make a birthday cake for his dear old granny. He happened to have a cold too and was feeling kind of sneezy. When he came to the first pig's house he wasn't there to eat him, he just wanted that cup of sugar. But the pig, who was very rude, refused. Then the wolf just happened to sneeze and his sneeze was so powerful that it blew the house down. With the house gone and the pig lying there dead in the rubble, the wolf figured it would be a shame to leave him there and decided to eat him. And so on for another house until he winds up at the house made of brick where his sneezes do nothing and he's arrested. What's interesting here is that the wolf doesn't really deny the specifics of the story. He did go up to the pigs' houses and he did huff and puff and blow them down before eating the pigs, but he maintains that this was not his intention. He didn't mean to kill the pigs, so he can't be blamed if he kind of sort of did, right? That's what I mean about these stories becoming inadvertent explorations of us as a culture. In the original version the crime the pigs commit that allows them to die is that they didn't plan ahead and make their houses out of something stronger. They took the easy and convenient path and paid the price. The wolf really isn't a character in that version, he's a consequence. The virtuous third pig is the one who took the time to make sure he was doing everything right - he's the character we actually get to know. In this version, however, the crime the pigs commit is really rudeness. If they'd given the wolf sugar when he asked for it, the wolf contends, he wouldn't have still been there and sneezed in such a way as to blow their houses down and kill them. So here we see that being rude is the ultimate sin. Now, granted, the wolf is a really unreliable narrator - we have no idea if he's telling the truth about his intentions or not - but that still makes this a fascinating story. Here the focus is off of the pigs and onto the wolf. We're looking at the personhood and motives of a character who previously had no development to speak of. It's a classic case of a modern retelling flipping the script and giving us a more complex view of the villain. Like what Grendel does for Beowulf, only much sillier. The thing is, as much as all of this is very very silly, I think there's a fair amount of value in it. Yeah, the wolf is a very unreliable narrator and probably lying, but there's something important in showing kids that a story has more than one side. The idea that the wolf might not just be the bad guy likely hasn't occurred to them, and teaching children that there is complexity in every case is very valuable. Perhaps where this is better examined, though, is in the children's play Blame It On the Wolf by Douglas Love. I remember this play in particular because my sister's girl scout troop (of which my mother was the leader) performed it when I was little. I sat there in the public library event room and this play freaking blew my mind. Why? Because it's play in which hordes of fairy tale character get together and put the wolf on trial. Ostensibly he's on trial for eating Little Red Riding Hood's granny, but they bring up basically every bad thing a wolf has been blamed for doing in a fairy tale. The wolf's defense? Bad press. When bad things happen it's more convenient for people to have a scapegoat, so they pick him. They blame it on the wolf. For five year old Deborah this was earth-shattering. It had never occurred to me before that people might not be automatically telling the truth about things like this. I mean, I definitely had lied before and was pretty adept in trying to shift blame around, but somehow I thought this was a new idea that I'd come up with. It was really surprising for me to see this from a different perspective, one where the person being blamed was actually there to defend themself. It's a valuable life lesson: the people who get the blame are often not the people who deserve it, and blame, like most things, can be swayed by money and power. I'm not saying that your kids should immediately become politically disaffected and jaded, but I do think it's worth introducing them to these concepts before they're adults. Why? Because kids aren't idiots and they're apt to figure this out on their own eventually. Introducing them the concept early on gives them a framework through which to understand the petty injustices and big freaking miscarriages of life. Moreover, stories like this teach a child compassion. It's easier to be compassionate to someone everyone else is turning on when you have a concept already of how that story can go. Stories like Blame It On the Wolf and The True Story of the Three Little Pigs and even The Story of the Kind Wolf help kids to recognize when they are allowing stereotypes to cloud their judgment. More and more our society is one in which the blame is something determined by who has the most money and the best story - that's not okay with me. If we want a generation that values justice, then we have to allow children to understand that the official story is not always the correct one and that there's always worth in listening to someone else's side. Sure these books are silly, but they're also helpful. I, for one, could do with a world where the wolf gets to give his side more often.